Perfect to maintain your guns. It can be used at home or at the range, the case is comfortable and can be put easily in your range bags. Nice, handy, most things are in it. However some extra space (on top of the extra space already foreseen) to put in some lose items like spare springs could be helpful. Some elastics sewed on? So convenient,everything i need in one pouch. The kit is space saving,light to carry and and your have all your cleaning & disaaembly tools in one place. Very nice product,fits nicely in my range bag. The kit is compact enough for the range bag and useful for use at home,coming with a large folding mat. Super set, zit alles in en meer! Sevice is als altijd meer dan goed. The folks who designed this kit did a good job in catering for pistols of different sporting calibers. The inclusion of punches and hammers is a definite benefit for shooters who have never detail stripped their guns before, and other components of the kit are useful for gun maintenance at home and on the range alike. 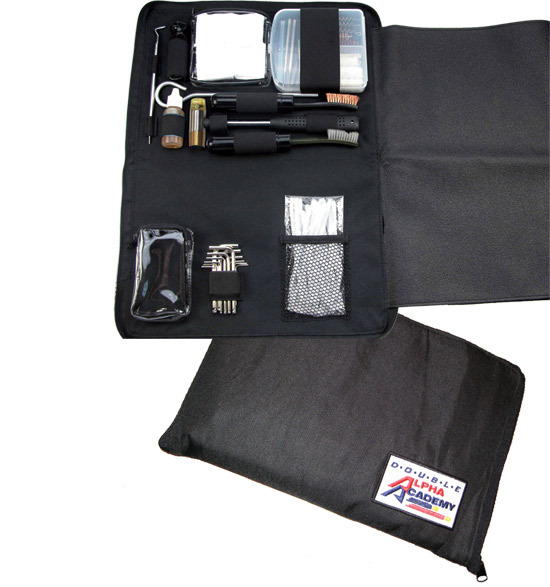 The kit is compact enough for the range bag and useful for use at home, coming with a large folding mat. I rate the kit as phenomenally good! Mooi set cleaning kit, past goed in de tas. Verzending is supersnel en zeer goed verpakt. Very nice product, fits nicely in my range ready bag, contains everything I neef and van hold some extra items. Quite nice range cleaning kit, it has potentials, but not that big of a quality product unfortunately. I was hoping for more quality since it's CED that makes this together with DAA. The FIRST EVER cleaning kit truly custom-made for IPSC / IDPA shooters ! The CED/DAA Range Ready Cleaning Kit includes everything needed for calibers ranging from .22, 9mm/38 Super, .40 / 10mm, and .44/.45 Cal. 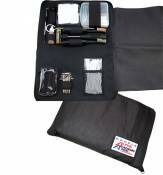 Designed to fit comfortably into your range bag, the Range Ready Cleaning Kit opens to reveal a rubberized 36x43cm cleaning mat built right into the kit itself. The mat, made of durable PVC material, is the perfect workstation for your field repairs and pistol cleaning needs. The non-slip surface prevents parts from getting lost and is easy to wipe clean after use. When finished, simply fold and zipper close. The entire Cleaning Kit measures only 20x30x3.5cm and easily stores away inside your CED Professional Range Bag or Shooters Back Pack. The Range Ready Cleaning Kit comes packed with custom features and tools. Included are all the brushes and swabs needed for proper gun care, two utility brushes with storage cases, a custom two-head brass / nylon hammer, a custom hex key set in both metric and standard sizes, a 4-bit custom screwdriver set, a plastic storage case for storing brushes & parts, a custom steel punch set, a stainless steel double-head cleaning tool for tough to reach areas, cleaning rod with patch loop tip, cotton cleaning patches, wired extractor/firing pin cleaning strips, & a 0.5 oz bottle of the famous Shooter’s Choice FP-10 lubricant, all designed specifically to fit into our compact, convenient and very functional cleaning kit. An extra clear plastic zippered storage pouch has been included for essential replacement parts you might want to keep close on hand.